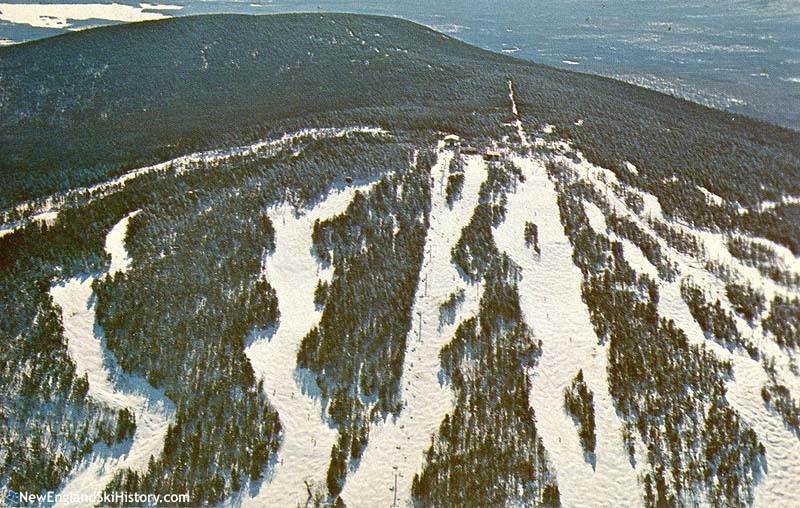 Located in Southern Vermont, Stratton Mountain is one of the tallest peaks in New England at 3,936 feet in elevation. 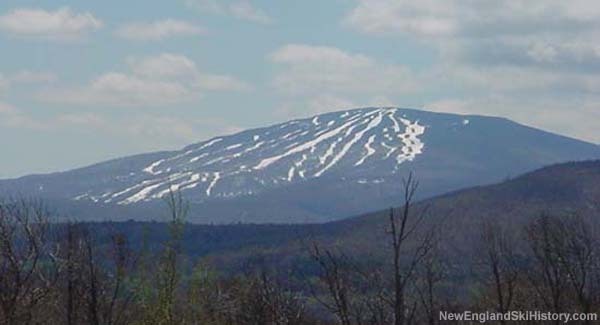 The development of Stratton Mountain dates back to the late 1950s, when a group of skiers became interested in constructing a ski area on the then-remote peak. 10th Mountain Division veteran and ski racer Robert Wright met with Frank Snyder, enticing him to visit the mountain in the fall of 1959. The Stratton Corporation was established as a Vermont corporation on July 5, 1960. An arrangement was made to obtain matching loan funds for every dollar invested by stockholders. Work snowballed in 1961, continuing at a feverish pace through opening day, when the access road to the ski area was still under construction. Lift served skiing debuted on the northern peak of the mountain when Stratton Mountain ski area opened with 3 double chairlifts (installed using a then-unique helicopter method) in December of 1961. Designed by Gene Gillis of Sel Hannah's Sno Engineering firm, the area also sported a three story base lodge. 1966-67 saw an expansion of the base lodge, as well as the installation of another double chairlift. The Grizzly Bear and Polar Bear trails were added for the following season. 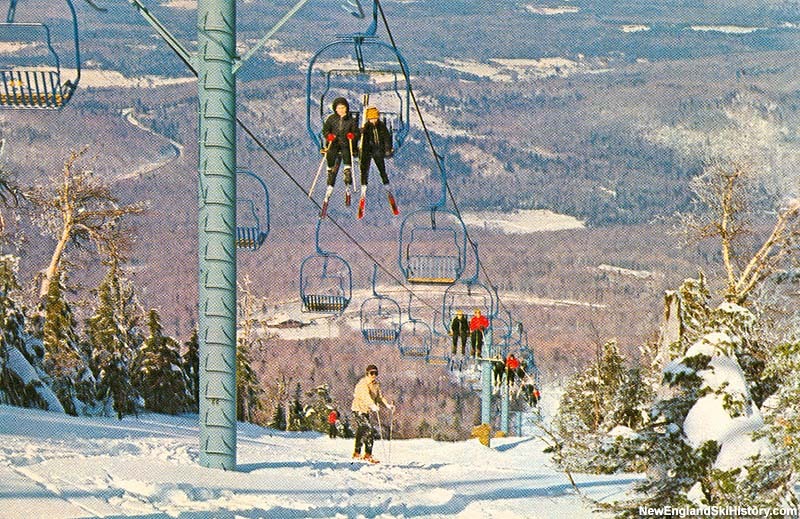 An additional two chairlift expansion was planned for the 1971-72 season, however Stratton became one of the first ski areas in the state to run into trouble with the new Act 250 law, when residents of Winhall forced the ski area to first overhaul its sewer system in advance of potential increases in skier vists. In 1972, Warren Hellman and Donald Tarinelli founded the Stratton Mountain School to help their children advance their ski racing careers while not conflicting with their high school education The school continues to operate to this day. On February 10, 1974, 20 year old James Sunday was paralyzed after a fall while skiing at Stratton. In a landmark decision three years on June 9, 1977, Sunday was awarded $1.5 million by a Vermont jury. The decision resulted in significant price increases throughout the ski industry, due to skyrocketing liability insurance costs. Snowmaking was expanded to the summit of Stratton for the 1974-75 season, as pipes were installed on North American and Standard. In 1975, Donald Tarinelli was named General Manager of the ski area following Harvey Clifford's departure to purchase Glen Ellen. 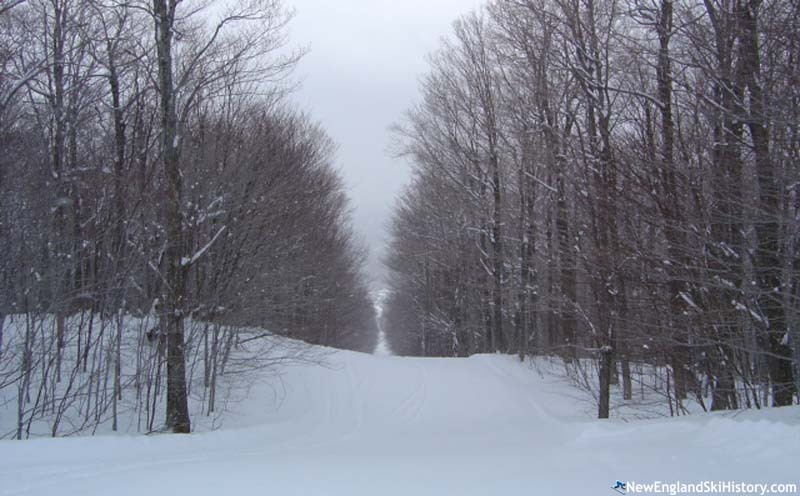 In the spring of 1977, the International Paper Company donated 1,023 acres of land on Stratton Mountain, containing the bulk of the ski terrain, to the United States Ski Educational Foundation, to benefit the United States Ski Team. The USSEF then granted the Stratton Corporation a 99 year lease at 2.25 percent of the ski area's gross ticket revenues. Stratton then used the value of the lease to fund the purchase of two new chairlifts. The Stratton Corporation may have later acquired this tract. Late in 1979, Stratton purchased nearby Bromley and assumed its multi-million dollar debt. Stratton's debt was now reportedly up to $7 million. Moore and Munger, Inc. came to the rescue and purchased Stratton in early 1980. During during the 1980s, Jake Burton found an ally in Stratton, when it became the first ski area to allow snowboarding. In addition to this, Stratton also became home to the first snowboard school, and would start hosting US Open snowboard races in 1985. Stratton would later become home to the first half pipe and formal terrain park on the east coast. The US Open snowboard races weren't the only non-skiing event to make a splash at Stratton in 1985. With the Cranmore facility in limbo, the Volvo International Tennis Tournament was moved to Stratton. Tennis star Ivan Lendl became a Stratton skier during 1985-86 ski season, after winning a season pass at the tournament. 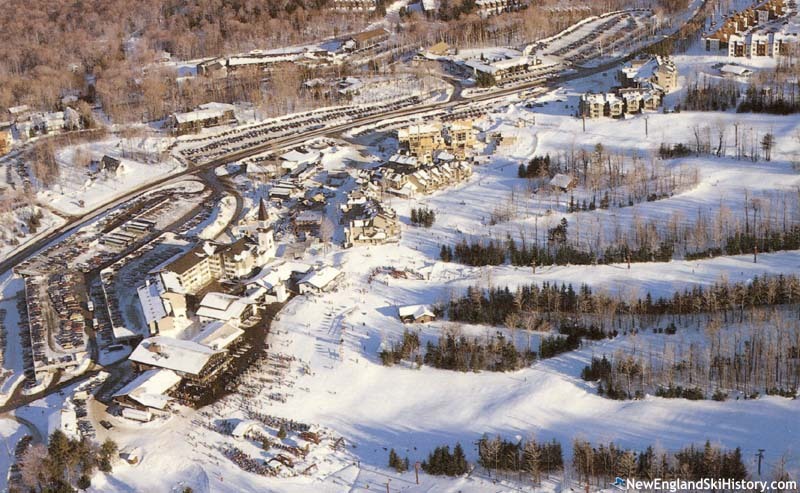 In the mid 1980s, in conjunction with the expansion of Stratton Village, the lift network at Stratton was modernized. Four new Poma chairlifts were installed in 1985 and 1986, replacing aging Heron-Pomas. In the spring of 1989, Victoria USA, Inc., a Japanese sporting goods company that owned Breckenridge, purchased Stratton. Later that year, the Kidderbrook area debuted. Along with the lift and new trails, a new 12,000 square foot Sun Bowl base lodge, the projects represented a $7 million investment into the resort. Intrawest purchased the ski area from Victoria USA, Inc. in 1994 and quickly started another round of new lift installations, eventually rolling out four new high speed six pack chairlifts. With the installation of these new high speed chairlifts, the fixed grip quads of the area quickly lost popularity. With its parent company facing some tough times, Stratton removed the often-idle Kidderbrook chairlift following the 2006-07 season. The North American trail was renamed in honor of founder Frank Snyder during the 2007-08 season, becoming Frank's Fall Line. Intrawest announced $6.5 million of projects for the 2013-2014 season, including new snowcats, improved snowmaking, two new glades, and base resort improvements. Following a fire, a $9 million base lodge expansion took place in 2015. In 2017, Stratton's parent company Intrawest was acquired by what would become known as Alterra. Its first major investment was a new high speed detachable quad in the Snow Bowl, which debuted in January of 2019. "I remember trips up and down the unsaved access road in our Jeep with trash can tied to the back, to carry all the skis....amongst so many other memories!" "I began skiing at Stratton in the mid 60s. At age 13, my parents gave me a special gift of spending a week on my own skiing. I took lessons from Emo's terrific staff of instructors and stayed in the bunk room of Birkenhaus. I met many families who invited me to join them for meals. These memories are still vivid 50 years later. I am grateful to my parents for giving me this unique opportunity. " "I was a supervisor in the ski school for a number of years, late 70's early 80's. Those years were spent with folks both co-workers and paying skiers,from the 4 corners of the globe, some of the greatest people I've known in my life. Most fun, morning demo's and doing sync skiing with Hansi B and Alois on N American"
"Every year I go with my friend Revel, and we always have the greatest time! I remember when I graduated ski school it was one of the proudest moments of my life! I recommend this to ANYONE! See you on the slopes!" "I remember going to Stratton for a grooming trade show. I was a groomer at nearby MT Snow at the time. We were able to hop into any machine that was on the snow and running to operate it and get a feel for it. Others would have an operator take you for a ride. The Hagglund was most impressive and fast. I believe this was 1990. Also fond memories of ski trips from school."